The summer seems to have gone by, well, what we could call a summer. The Sedum fields have been somewhat waterlogged and growth has not been good. We were hoping for an Indian Summer and are still crossing our fingers. Sales have been delayed due to the weather as no one wants to put Sedum on the roof when its pouring with rain!!. Hopefully now things will improve. Our fields are all ready for rolling. Lots of weeding to do! Some companies do not weed their mats which I find strange. Many of the Sedum growers tend to leave weeds in, I don’t really understand this. Once the Sedum has established the weeds are blocked out but initially during the early growing period weeding is necessary. Getting weeders is another story and even I have been down there doing my bit! Great news and great excitement is that we have just launched our new S.Pod or Sedum modular Pod. This small tray holds all the sedum, substrate and drainage layer in one easy tray. All that you do is put it on a waterproofed roof. Its a fantastic new concept and makes life a lot easier. The Sedum seems to be very happy growing this way as well and it may eliminate the weeding aspect of the mats in the early stages, all good news. We are just about to launch the modules so hopefully they will be popular. Many of our colleagues are doing the same so this does seem the way forward. Enormous amount of work in the pipeline. Lots of new houses going up want Sedum Roofs and we are doing well with the walls and the wild flower roofs as well. 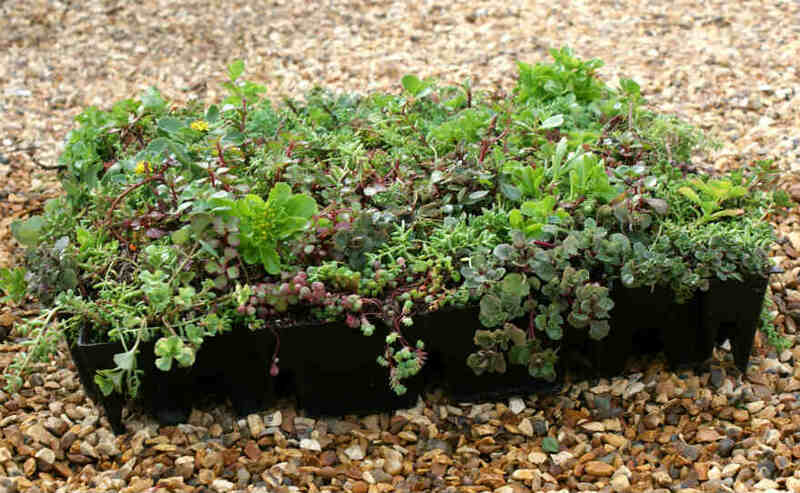 This year there are a lot of plugs available so any one who wants Sedum plugs let us know!! Back to work now, things to write for the site and pictures to take!